What started as a class project became a statewide campaign to help save lives in Florida. Students in a mass media class at Tallahassee Community College (TCC) were tasked with creating projects to help persuade young people to put their phones down when driving. The projects were inspired by Demetrius Branca, whose son Anthony was killed by a distracted driver in November 2014. Anthony was a TCC student at the time of his death. Each team of students worked for four weeks to create a website and a Public Service Announcement video. The Anthony Phoenix Branca Foundation served as the client for the project and awarded $500 to the team that created the best project. Projects were judged at a local PR agency. One team of students wrote a rap song to encourage Florida drivers to Just Drive. 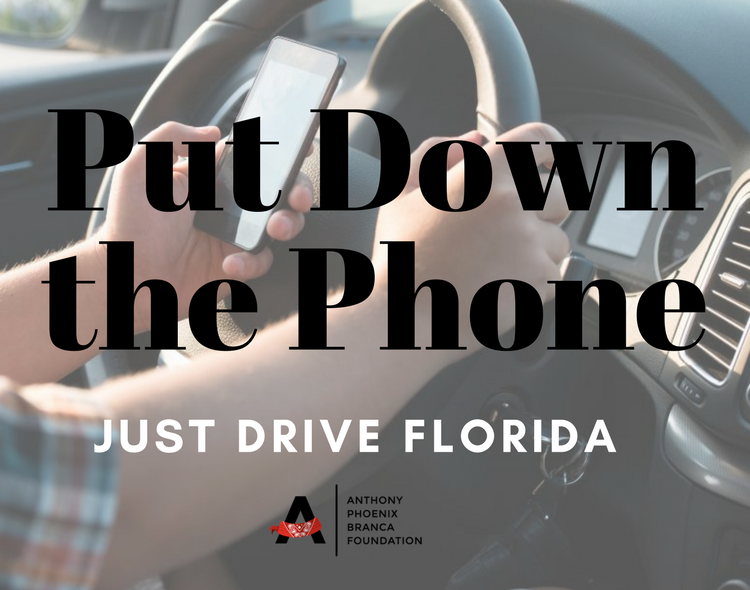 Another team of students produced a video encouraging Florida drivers to Put Down the Phone, reminding drivers at TCC that it could happen to you. Another team produced a video in which a TCC student recalls a distracted driving related crash that injured her earlier this year. The crash was caused when a driver picked up her phone to change the music. Florida is reportedly one of the worst states in the nation for distracted driving. There are 50,000 distracted driving crashes each year, more than five every hour, according to the Florida Department of Highway Safety and Motor Vehicles. Those crashes result in 3,500 serious injuries and more than 200 deaths each year. Florida law does little to prevent drivers from using their phones while behind the wheel. Several news reports have referred to it as one of the weakest laws in the nation. Texting and driving is not a primary offense in Florida, which means law enforcement personnel cannot pull someone over for using a phone behind the wheel unless that person is breaking another law. Students in the class also recorded video selfies explaining why it is important for drivers to put their phones down before driving. The videos will be shared on social media with the hashtags: #JustDriveFL and #BecauseAnthony. Floridians are encouraged to join the war against distracted driving and record their own videos to share on social media.